The race for president has tightened since mid-October: Hillary Clinton now leads Donald Trump by three points nationally. 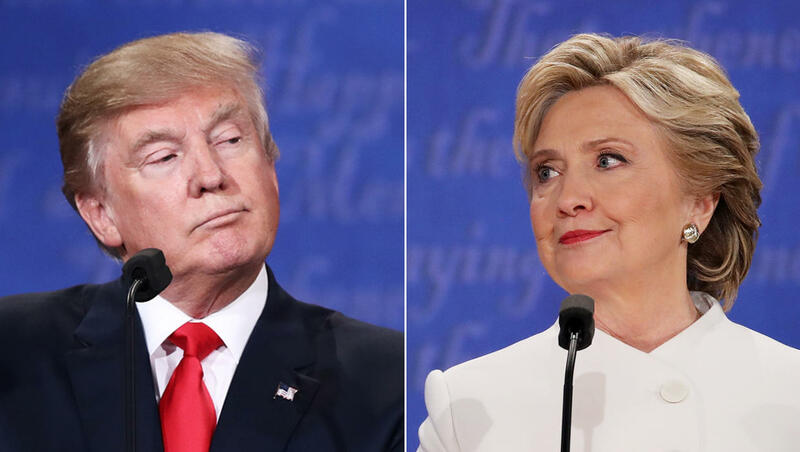 Just over two weeks ago, after the second debate and amid accusations by women that Trump had made unwanted sexual advances towards them, Clinton’s lead had expanded to 9 points, up from her 4 point lead in early October. In a two-way match-up (without explicitly naming third party candidates), Clinton’s margin is similar: she leads Trump by 3 points among leaned likely voters, down from an 11 point lead a couple of weeks ago. At this late date, few voters say they might change their minds. As the FBI begins to sift through emails belonging to a top aide of Hillary Clinton, 62 percent of likely voters who have yet to go to the polls say the recently discovered emails and the FBI’s actions don’t make a difference to their vote, though about a third say it makes them less likely to cast their vote for Clinton. Most Republicans say the FBI’s actions make them less likely to vote for Clinton, while most Democrats and independents say it makes no difference. Eight in 10 registered voters have heard something about the latest development in the Clinton email controversy, including nearly half who have heard a lot about it. The allegations of unwanted sexual advances brought by a number of women against Donald Trump are also familiar to registered voters – most have heard or read a lot about these allegations. Still, six in 10 likely voters who have yet to cast their ballot say the allegations don’t make a difference in their vote, though four in 10 say they make them less likely to vote for him. Most Democrats (60 percent) are less likely to vote for Trump because of these allegations, while most Republicans (81 percent) and independents (59 percent) say the allegations make no difference. Majorities of each candidate’s supporters say they are at least somewhat enthusiastic about voting this year – but slightly more Trump voters than Clinton voters are very enthused. Nevertheless, at 49 percent of likely voters overall, enthusiasm lags behind the excitement voters felt prior to the 2012 presidential election. Then, 62 percent said they were very enthusiastic about voting. Voter enthusiasm is down among older and younger voters, as well as white voters and black voters. Just over half of each candidate’s supporters say they strongly favor him or her. About one in four have reservations, and a similar percentage says theirs is a vote against the other candidate. The demographic contours of the race have not changed much. The gender gap remains notable this year: by large margins men support Trump and women support Clinton. In fact, Trump’s support among men has increased in this poll after dropping in mid-October, amid allegations that he made unwanted sexual advances towards women. His support among men, and white men, is now similar to what it was in early October. Trump leads among white voters, including white men and whites without a college degree. Clinton has the support of white college graduates, and women regardless of educational attainment. Those living in households with a union member also back Clinton by a large margin. This poll was conducted by telephone October 28-November 1, 2016 among a random sample of 1,561 adults nationwide, including 1,333 registered voters. Data collection was conducted on behalf of CBS News and The New York Times by SSRS of Media, PA. Phone numbers were dialed from samples of both standard land-line and cell phones. The sample of likely voters is modeled among registered voters (N=1,333), assigning each respondent a probability of voting based on their responses. The margin of error for the sample of likely voters is plus or minus three points. This poll release conforms to the Standards of Disclosure of the National Council on Public Polls.